Providence Restaurant opened in 2015 with a new twist on the traditional dining experience. It wasn’t just the ingenuity in the kitchen that set Providence apart – it’s the fact that it operates as a non-profit restaurant, an extension of Providence Culinary Training’sprogram at Second Harvest Food Bank. Led by executive chef Jeff Bacon, Providence Restaurant has enjoyed tremendous success in the Triad. And in September 2018, phase two of this innovative concept, Providence Kitchen, opened right in the heart of downtown Winston-Salem. Located in the BB&T Financial Center, Providence Kitchen is open to the public. It was super-easy to access. We parked in the public parking garage and simply walked in the front door. Just because this restaurant is located in the BB&T building, doesn’t mean it’s exclusive to employees of BB&T (though you may be jealous of all those who work in the building and have easy access to Providence Kitchen on a daily basis). It’s open to the general public, Monday – Friday from 8 AM – 3 PM. I was super-excited to try Providence Kitchen. Having had the pleasure of dining at Providence Restaurant on a number of occasions, I knew the food would be excellent. I just wasn’t entirely sure what was on the menu. I knew they served lunch, but I was delighted to learn that they also serve breakfast. As a fan of breakfast at any time of day, this was a huge win for me. We started with the Hot Mess Biscuit. [Insert the sounds of non-nom-nom here.] Oh, goodness. Where to begin? Scratch-made biscuits that, frankly, may put your grandmother’s to shame… The Hot Mess Biscuit is topped with gravy, a choice of meat, eggs, cheese, green onions, and a honey-bacon crumble. The Southern roots behind this dish are bursting with every incredible bite. We had our served with a delicious piece of fried chicken – it wasn’t remotely greasy. I confess it was the first time in Rosey Review history where we literally cleaned the plate. We have to pace ourselves when we go on restaurant reviews, and while it’s been tempting to clean the plate on numerous occasions, we’ve generally managed to restrain ourselves. Next, we sampled the Deutsch Baby Pancakes Old Salem Style. I’ve heard of popover style pancakes before but haven’t actually tried them. They were, in a word, incredible. The Old Salem style pancake is topped with cinnamon sugar, a local berry compote, and a decadently creamy house-made ricotta cheese. The flavors created a wonderful blend of tart and creamy-goodness. But hey – don’t worry. If sweets aren’t your thing, Providence Kitchen has a savory version – the Mannheim has ham, Havarti cheese, spicy maple, and powdered sugar. YUM! And for the second time in Rosey Review history, we cleaned the plate. (Are you starting to see a pattern here? There were only three of us!). We moved away from the breakfast menu, and on to lunch. And first up, we tried the Carolina Cobb Salad. Y’all, I’m not generally one who goes for salad-as-a-meal, but I do love Cobb salads. And for this one, Providence Kitchen has put their own unique twist on the traditional favorite. It has all the elements of a Cobb salad, but it’s got a personality of Providence-proportions. Mixed greens are served with dollops of smoky pimento cheese, along with jalapeno bacon, pickled okra, hard-boiled egg, and candied pecans. Top all this off with their house-made Vidalia onion vinaigrette, and you will have a salad to drool over. Friends, I am not a picky eater. It would be hard to be picky when you review restaurants on a monthly basis. But okra is not a vegetable that I gravitate towards and I actually have some emotional trauma related to fried okra that my mother used to make me eat as a girl. But I actually loved the pickled okra that was in this salad. It added a really nice burst of flavor along with the smokiness of the pimento cheese. Next up – Ancient Grains Bowl. “The Office” fans may remember the episode in which Michael said, “Nobody likes beets, Dwight!” WRONG! Michael would be investing in Schrute Beet Farm if he sampled this incredible dish. A mix of farro and freekeh has been mixed with locally grown beets – both red and yellow – as well as root vegetables, heirloom carrots, and caramelized onions. The whole thing is tossed with a maple cider vinaigrette. This is a cool salad – people expect it to be warm or hot when you are referring to grains, but it’s a beautiful medley of flavors — a very light salad that doesn’t leave you feeling heavy, but full and satisfied. I found it to be delightful. Is there anything more all-American than grilled cheese and tomato soup? It’s hard to improve upon a classic, but trust me – Providence Kitchen has stepped it up by about 20 paces. Let’s start with their 4-Cheese Grilled Cheese. I tend to subscribe to the “more the merrier” school of thought when it comes to cheese, and apparently, my friends at Providence Kitchen agree. They’ve layered Havarti, smoked Gouda, cheddar, and Swiss cheeses on Texas toast to create a grilled cheese experience that has to be tried. 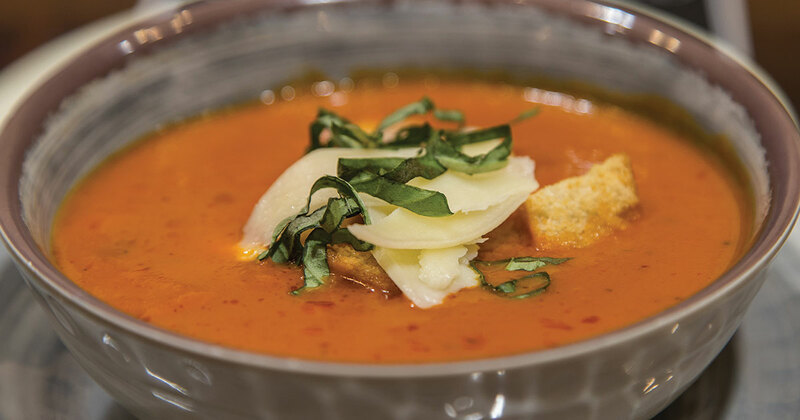 Then, it’s move over Soup Nazi – Providence Kitchen has created a Tomato Basil Soup that will warm you from the inside out. Creamy, with a bold, rich flavor, this traditional favorite is just magnificent. Put the two together, and your inner 12-year-old will know a new level of comfort food. Our final sandwich of the review was a Carolina Cuban. And hello, Spicy Kick! I hear ya! Served on a Cuban roll, layers of smoked pork shoulder, jalapeno bacon, ham, smoked Gouda cheese, and pickle blend with Lusty Monk mustard and chipotle lime mayo for a sandwich that is overflowing with flavors. I love spicy, and this sandwich delivered! Served with battered French fries that were perfectly crunchy – this is one of those sandwiches that can easily cover two meals. The portions were generous and, of course, delicious. A meal is never over without a little something sweet. We tried the Providence Kitchen Brownie. Available daily, the brownie is big enough to share, but we wouldn’t judge you if you didn’t want to. Chocolate never tasted so sweet. With all that said – I know you’re eager to try Providence Kitchen for breakfast or lunch! And the great news… while the restaurant has ample (and comfortable) seating, they know you’re busy, so they offer carry out. They have a grab-and-go shelf where you can order online and have your lunch ready to pick up at a designated time. No lines! Great for busy days at work when you don’t have time for a long lunch. Plus, mobile ordering is available via the app, MobileBytes. I’ve already got it downloaded to my iPhone! Best of all – beyond great food, eating at Providence Kitchen is dining for a cause. Because Providence Kitchen is a non-profit restaurant, all proceeds and tips go to lift up trainees and to empower their families and our community. Providence Kitchen and all Providence programs also make it a point to buy local and support local farms. Visit soon and know your lunch is helping to make a difference. And be sure to tell them that Rosey sent ya! Rosey is a bit of an enigma at Forsyth Woman. In fact, a few different people have borne the name! Though we will not reveal her true identity, Rosey is and will continue to be an important part of our team! No matter who has been the resident Rosey at any given time, they’ve all shared a common love for good food as well as a love for writing! The talents of our past and current Rosey have been the recipes for one of the most popular columns in the magazine. If you know who she is, don’t ruin the fun! She likes to stay under the radar, and she hopes to continue the mystery for many years to come.